After indulging so much of spicy food... and of course too much of meat... the three of us (we went off without Mr H... he has to work and earn $$$ for us to spend..hahaha!!! )...we are on seafood diet for a week...Mr H Jr will be green without his meat!!! Preheat the oven to 200C. Line a 23cm loose base flan with the shortcrust pastry. Blind bake for 15 minutes until its light brown. Leave it to cool. Reduce the oven to 180C, line a baking tray with aluminium foil..... mix the pumpkin with 1 tablespoon of olive oil and roast for 20 minutes. Haven't baked for a while as the temperature is rising these days...can't stand the heat. 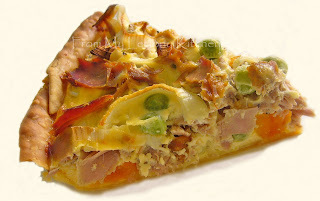 The tuna quiche looks delicious. And I look forward to your Malaysian feast pictures!